Shopping for gutters isn’t the most glamorous nor the most interesting home improvement task. With so many options available, the decision can feel overwhelming, thus prompting homeowners to just pick whatever has been offered to them without taking the time to carefully weigh the pros and cons of different products. However, just because a chore isn’t as fun, doesn’t mean you can afford to rush through it without the proper care..
Gutters serve a very practical and basic function: to guide water to the proper drainage channels, safely away from your home.In doing so, gutters protect your roof, sinding, windows, doors, landscape and even your property’s foundation against deterioration due to water damage. Gutters are tasked with routing water away from your home and into a drainage system. Needless to say, gutters are most needed in homes that experience a substantial amount of rain throughout the year. Homes that are situated on a plot that slopes upward may encounter pooling problems along the foundation. Gutters can help direct the water towards the downward sloping portion of your house and can direct any runoff from the surrounding areas, including the foundation. Homes with roofs that have little or no overhang at all run the risk of allowing water to pour directly onto the foundation. Gutters are especially needed in these types of homes as frequent rains will result in water pooling around the foundation. This can lead to basement flooding and serious, costly water damage in your home. Installing gutters is thus a worthwhile investment. If your home meets any of the criteria listed above, then the only thing left to assess is whether your roof can handle a gutter installation. Keep in mind that improperly installed gutters and gutter covers in Syracuse can do more harm than good. There’s always the risk of damaging the fascia. However, choosing to work with a reliable gutter company can help you avoid this issue. 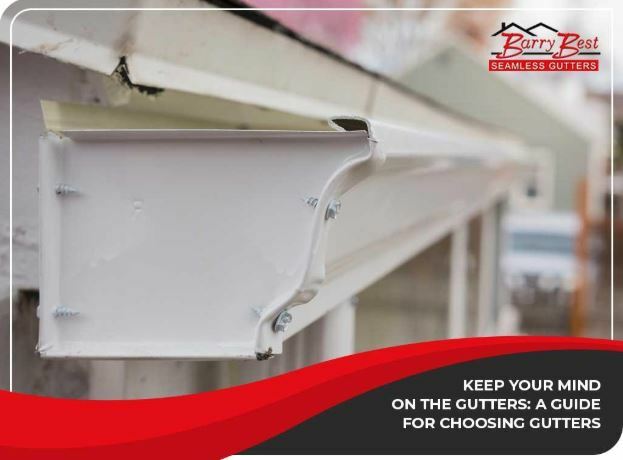 After determining whether gutters are essential or merely optional for your home, the next step is to evaluate which gutter materials are available to you and which of those is best able to cope with your home’s requirements. Below are the top gutter materials preferred by installers and homeowners. Aluminum is the most commonly used gutter material. This is in part because of how easy aluminum gutters are to install. Aluminum gutters also provide decent protection when it comes to weather-resistance, and at a very economical price point. While aluminum gutters can enhance a home’s curb appeal, they are prone to damage brought on by a combination of strong winds and flying debris. Aluminum gutters are prone to leaks and thus require more upkeep than other materials. Nevertheless, with proper installation and high-grade materials, aluminum gutters are a good option for just about any home as they combine style, durability and affordability. Stainless steel gutters are the top choice for property owners who don’t mind spending a bit more, especially for a gutter material that can last as long as the house itself. Along with copper, stainless steel is a high-end custom gutter material that offers both elegance and longevity. Another high-end gutter material choice, copper gutters ares visually stunning and high-performing. They won’t rust and don’t require any paint or finish. Copper gutters look good on both old-fashioned and modern homes. It’s worth noting that copper gutters fade into a verdigris patina due to oxidation. This doesn’t affect the performance of the gutters; it just gives them a very distinct look that will undoubtedly add character to your home’s exterior. Vinyl gutters are easy to install and come in a wide range of fade-resistant colors. Vinyl gutters are one of the most affordable gutter options, making them among the most popular choices for homeowners on a budget. One drawback of vinyl as gutters is that the material generally isn’t able to withstand high temperatures and may crack, warp or break due to constant exposure to the elements. While it may seem like an odd choice, wooden gutters are still popular among architectural purists. However, wood gutters are out of favor with many homeowners due to the weight (heavy), cost (expensive) and maintenance requirements (tedious). Redwood and red cedar are naturally resistant to decay, but a majority of wooden gutters need to be treated annually to boost water-resistant properties. Keep in mind that whatever material you choose, gutter installation is a project best done by a professional. Reach out to your trusted local gutter company and provider of gutter protection in Hamilton, NY, should you need any gutter-related assistance to avoid accidents and subpar gutters. Once you’ve settled on a material for your gutters, it’s time to pick a gutter type. You can choose between seamless or sectional gutters. Below are the pros and cons of each. Seamless gutters are a continuous sheet of eavestrough joined only by joints and fasteners at the corners and downspouts. The lack of seams makes these gutters less prone to leaks than sectional gutters. Seamless gutters are usually made from aluminum or stainless steel. Both variants offer great durability and curb appeal, but aluminum offers better resistance against rust. In any case, seamless gutters gives your home or commercial building better protection because they are custom-made to fit the exact lines, curves and measurements of your property. You also have more options in terms of colors and styles. Sectional gutters are popular among DIY-ers as the installation simply requires piecing together the different sections of the gutter system. However, because of the way they are constructed, sectional gutters are more prone to leaks. They are also more likely to clog because they have more areas that are susceptible to blockages. Still, sectional gutters are a decent option if you’re on a budget. Sectional gutters require more maintenance than seamless gutters. When it comes down to it, your choice of gutter material and style will depend largely on the general landscape and weather of your area, your home’s needs and, of course, your budget. Gutters are an extremely practical home feature that would benefit any homeowner.